Michelle has had a love for animals since a young age. She realized her passion for marine mammals after a Dolphin Encounter experience at Discovery Kingdom. Originally from San Jose, CA, Michelle moved down to Monterey to pursue a Marine Science degree from CSU Monterey Bay. She found out about SLEWTHS through a friend and immediately applied. Michelle joined the SLEWTHS family in 2010 and reached the Head Trainer level in December of 2016. Michelle is excited to learn from the SLEWTHS family and gain experience to pursue her dream of becoming an animal trainer. 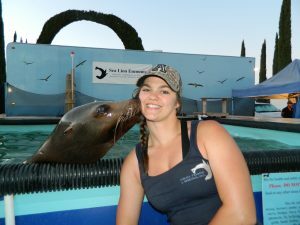 From the small town of Grass Valley, California, Melodie has always dreamed of working with marine mammals. After graduating with an A.S. degree in Natural Sciences from Sierra College, she transferred to CSU Monterey Bay in 2011, majoring in Biology. After hearing about the SLEWTHS project in 2012, she became part of the SLEWTHS family in December 2012 and has now obtained the position of Senior Trainer in December 2016. She loves every moment working in the lab and is excited about learning new things in animal behavior and husbandry. Jana was raised in Santa Cruz, CA and developed a deep love of animals and the ocean at an early age. 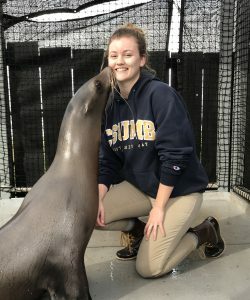 Participating in a dolphin trainer-for-a-day program in her early years helped her make the decision to pursue a career in the marine sciences and animal behavior fields. Jana graduated from UC Santa Cruz with a B.S. in Marine Biology and is now working on gaining the experience that will help accomplish her goal of working in the animal world. She happened to stumble upon the SLEWTHS project in June of 2014 when taking an animal training course taught by the director of the project. After interning for a week, she knew that SLEWTHS was exactly where she needed to be. She is honored to now be a part of the SLEWTHS family and is excited to create such positive, trusting relationships with these animals now and in the years to come. Kerissa came from a military family originally stationed in Virginia, then settled in Tucson, Arizona when she was 7 years old. She grew up riding horses and was a competitive gymnast for 15 years. When in Virginia her family would spend every weekend on the water which is where her passion for the ocean and marine mammals brewed. Once in Arizona they took a family vacation to SeaWorld and Kerissa fell in love with the dolphin shows. She then put gymnastics and animals together and made the decision she wanted to train dolphins! After an injury that ended her gymnastics career and military entrance, she moved to Monterey Bay to obtain a degree in Marine Science. In January 2015 she joined the SLEWTHS family and has now obtained the Trainer position. 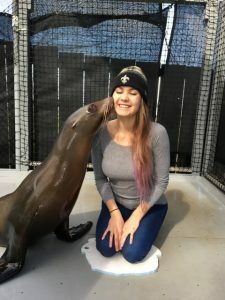 After graduation she would like to work for the Georgia Aquarium training their dolphins and eventually work towards a career with the United States Navy Marine Mammal program training either their dolphins or Sea Lions. She is very excited to see what the future has to bring for her here at Slewths! 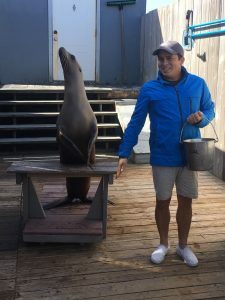 Originally from Sacramento, CA, Taylor grew a passion for working with marine mammals through annual family trips to the Monterey Bay Aquarium. She decided to attend California State University Monterey Bay to move closer to her dream and shortly after hearing about the SLEWTHS project through the school, she was welcomed into the family in August of 2016. She is now an Assistant trainer and is excited to continue growing through the project! Bree has always had a passion for marine mammals. Although she grew up in the small Central Valley town of Turlock, California she spent her summers growing up in Morro Bay, California where her love for the ocean environment blossomed. 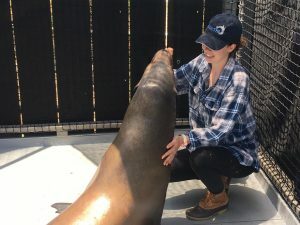 In high school she spent two summers attending Sea World’s Career Camp where she got to interact with various types of animals in a professional animal care and training environment. 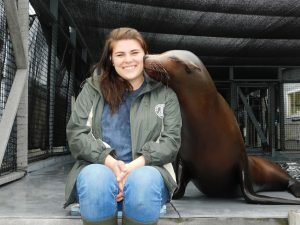 She fell in love and decided to pursue a career working with marine mammals. In 2014, she moved to Santa Cruz to go to school for Marine Biology. After hearing about the project while on a local whale watching trip, Bree was fortunate enough to join the SLEWTHS family in December of 2015. Bree is thankful to be a part of the project and excited for all the learning experiences to come! Kaitlyn found her love for marine life at a young age while visiting Sea World San Diego annually with her family. 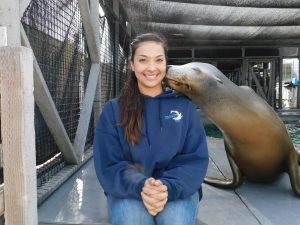 Her passion only grew as she moved from Los Angeles to Monterey Bay to work towards a degree in marine science at CSUMB. 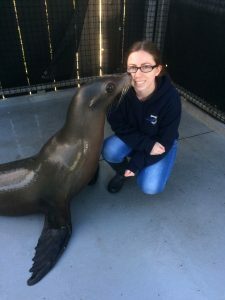 She started her marine mammal experience as a rescue and rehabilitation volunteer with the Marine Mammal Center in early 2016 where she then heard about SLEWTHS. 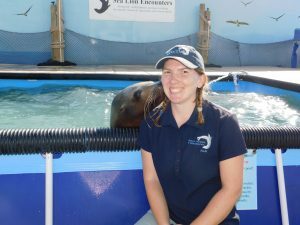 Since joining the project in May of 2017, Kaitlyn has earned her title as an assistant trainer and learned so much about training and husbandry! She is looking forward to continuing her career and bettering herself as an animal trainer. Growing up in a small desert town sparked her ambition in to becoming a Marine Biologist. 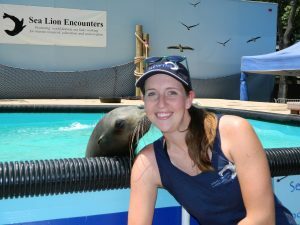 Krista first found her love for Maine mammals when visiting Sea World San Diego and watching the Orca encounters. She couldn’t believe the relationship the Sea World trainers had with killer whales and wanted that same connection. Working hard at her home town community college she was finally able to transfer to California State University, Monterey Bay as a Marine Science major, where she is still pursing her degree. Krista began working at the SLEWTHS Project in early November where she has gained so much knowledge in behavior modification. Krista is now Assistant Trainer and is super excited to begin her new responsibilities and can’t wait to see the opportunities in store! Since before she could walk, Jessie has been a member at the Long Beach Aquarium. She spent countless hours at the Aquarium’s touch pools receiving hands-on experience with ocean life that quickly developed into a desire to learn more about the ocean. In 2014 she moved from Southern California to the Monterey Bay to attend CSU Monterey Bay and pursue a degree in Biology. After hearing about the SLEWTHS project through a friend, she knew she had to apply. Jessie joined the SLEWTHS family in January of 2018 and is now a Senior Animal Care staff member. She is eager to expand her animal care knowledge and start her animal training journey. Originally from the small town of Cool California, Kat grew up consistently around animals. Her family bought a large acreage that allowed her to have a variety of animal family members from cats and dogs to chickens, horses, goats and llamas. This continuous relationship with animals fro a young age instilled in her a strong love for animals of all kinds. This love pushed her to attend college at CSUMB as a Global Studies Major with a minor in Psychology. From this she hopes to work internationally with foreign countries to improve environmental protection laws and expand wildlife preserves. 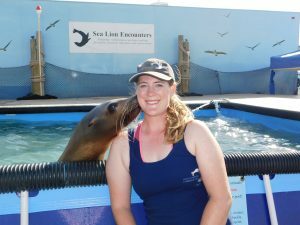 She joined SLEWTHS in November of 2017 recognizing the importance of teaching aquariums and how they help connect people with ocean life. She hopes to use her experiences here as a platform to pass on values of conservation to individuals around the world.